The CKCC ePistolarium is a virtual research environment that provides for browsing and analysing the letters in the CKCC corpus. The ePistolarium offers a full text search and supports wild card searches. The terms searched for are highlighted in the letter’s text. The second search option is the faceted search, which allows for selection of information from the metadata: corpus, date, sender, recipient, location. Faceted search also offers selection of names of persons that were recognized and identified within the letters. The tool displays the results of Keyword Analysis. This analysis is available for Dutch, Neo-Latin and French. Below each letter those words are shown that significantly often occur compared to the entire corpus. The computer generates alternative suggestions for search and for similar letters. Search results can be visualized on a geographical map and on a time line. 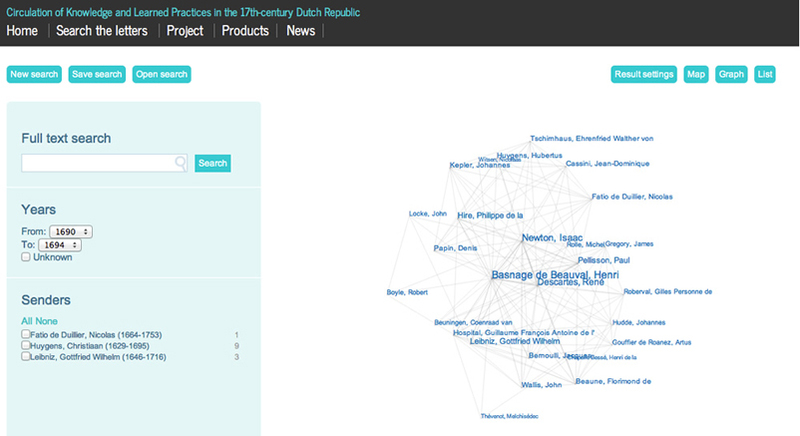 Furthermore, the networks of correspondents and of the persons named in letters can also be represented, respectively in correspondent and co-citation network visualizations.